“Under international standards, individuals must not be the target of defamation actions over comments made about public figures, particularly where the subject matter is of public interest.” – Sam Zarifi, ICJ’s Regional Director for Asia and the Pacific. Updated 4 Jun 2014: Askmelah says that with the latest development of people of Singapore has done the impossible by supporting the blogger to raise the $70000 sum in record four days, the politics in Singapore will never be the same. It also shows the poor judgment of LHL as a commander-in-chief who may have lost his cool in his judgement in this episode. Is he well advised by his team of scholar elites or he was advised correctly but chose to believe in his gut feel which turns out to be a disastrous move? Either way it shows poor judgement on his part, just like the mishandling of the population issues in the last 7-8 years under his reign. No apology can reduce the pain for causing so much hardship to many locally born citizens who have supported the PAP in the past when the leaders screw up big time. Updated 11 Jul 14: “PM Lee asks courts to decide damages in defamation suit without full trial” – “Prime Minister Lee Hsien Loong has made an application for the High Court to rule in his favour in his defamation suit against blogger Roy Ngerng, without going through a full trial.” I can not think of a precedence in such application of law. It looks like PM does not want to wash his dirty linens in the public in case many more bad presses or revelations against him. 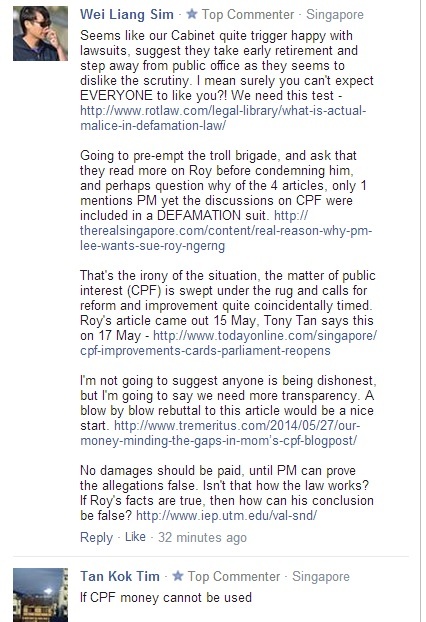 The only things that is in dispute is whether or not what Roy had written amounts to defamation. Roy had not explicitly written that PM Lee was criminally misappropriating CPF funds. He had only used a graphic which was of a similar style as one used earlier to describe the City Harvest Church criminal misappropriation case. Shameful act if you ask me! Updated 11 Jun 2014: “TTSH sacks blogger Roy Ngerng” – “The hospital added that its staff cannot defame someone without basis and must conduct themselves properly and honourably. Although they are free to pursue personal interests outside of work, Mr Ngerng had misused his time at work and the hospital’s computers and facilities for personal pursuits” – Askmelah: I think more than half the working population will be sacked if every employer adheres to this rule, if this is not dirty politics, Askmelah really don’t know what is. Roy Ngerng is officially Chee Soon Juan No2. “Raising S$70,000 in just 4 days could be a sign of how much the public is fed-up with the highhandedness of how the matter was dealt with by Lee. 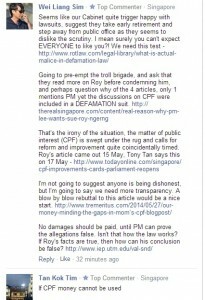 the controversial article can be found here (it has been removed from Roy Ngerng’s blog as “requested” by PM’s lawyer). ask the blogger to apologize. ask the blogger to apologize and pay cost. give the blogger a written warning. Set up an independent public enquiry to clear the CPF issue once and for all. Anything but using a sledge hammer with a top tier (read: most expensive) lawyer like Davinder Singh to threaten an ordinary citizen who earns a mediocre wage. What the PM choses to do tells us a lot the type of person he is. Little wonder why many Singapore political commentators prefer to remain anonymous, just like yours truly, in order to avoid attracting the wrong kind of attention. Askmelah is also very disturbed by the vast attention given to the defamation suit by the media has distracted people’s attention away from the CPF issues to the law suit instead. See A peek into the life of Chee Soon Juan. 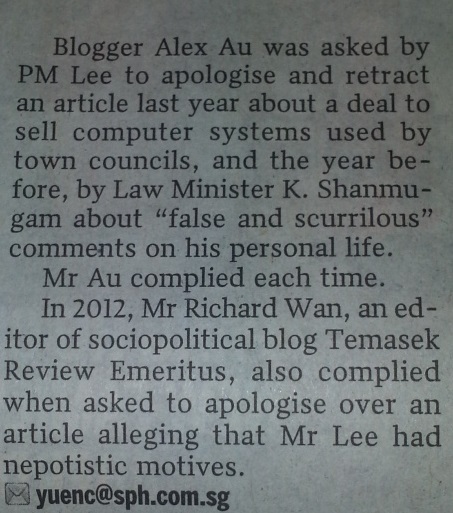 The two most libelous websites that make many “unfounded” accusations to the Singapore leaders and are able to get away with libel suits all these years are The unOfficial Yeo Cheow Tong Website and Sam’s Alfresco Coffee. The editors choose to remain anonymous and servers probably hosted overseas making them a lesser targets for libel suits in Singapore. This is yet another classic case of First World Economy, Third World Politics. “(Mr Ngerng’s articles) can and ought to be refuted by the Prime Minister for any misinformation or lapses in communication. That needs to be done for public good,” she added. On the issue of CPF, Ngerng seems to be rightly concern about the minimum sum requirement as the impact to many ordinary citizens esp those who may have lost their jobs or have become self employed. One such example is this one: Do you know that CPF can forbid you from using your CPF money half way into your HDB loan tenure ? and from the CPF website: Things to look out for when buying a property using CPF. 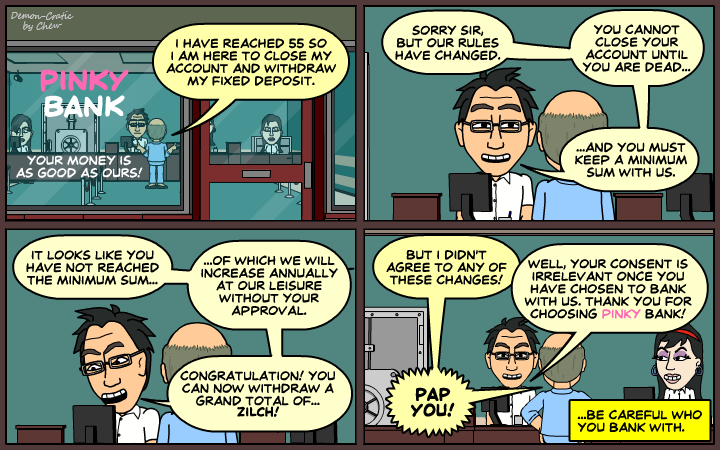 Does GIC invest CPF monies? The short answer is that GIC manages the Government’s reserves, but as to how the funds from CPF monies flow into reserves which could then be managed by either MAS, GIC or Temasek, this is not made explicit to us. What we do know from public sources: Singaporeans’ CPF funds are invested in bonds called Special Singapore Government Securities (SSGS) which are fully guaranteed by the Government. These are non-marketable floating rate bonds issued specifically to the CPF Board. These bonds earn for the CPF Board a coupon rate that is pegged to CPF interest rates that members receive. Under the Protection of Reserves Framework in the Singapore Constitution of the Republic of Singapore, the Singapore Government cannot spend any monies raised from Government borrowings. All the proceeds from the Government’s borrowing are therefore invested. WE REFER to the article “Greater peace of mind when S’poreans retire” (May 17), which reported on the Government’s plans to improve Central Provident Fund (CPF) schemes to strengthen social safety nets for lower-income and vulnerable groups. We hope these changes will fundamentally improve the state’s assurance of financial security for these groups, which include women. The increase of the mandatory minimum sum to $155,000 from $148,000 is worrying, since existing minimum sums are already not affordable for many Singaporeans. Figures reveal that in 2012, only 48.7 per cent of CPF members who turned 55 that year were able to meet the target then, of $139,000. As CPF is tied to employment, those who do not or cannot work do not have CPF-based retirement funds. These include full-time homemakers, who are mostly women. According to a 2012 Manpower Ministry report, 43 per cent of women who are economically inactive cited housework and caregiving as their main reasons for leaving the workforce. Consequently, women have less CPF savings than men, a trend identified by the CPF Board. As women live longer than men, it is crucial that their financial needs are met after they survive breadwinners who might have been supporting them. Increasingly, elderly women become dependent on children who, in turn, become a “sandwich generation” that needs to support both parents and their own children. As for health care, research from 2010 shows that 51 per cent of elderly patients have their hospital bills paid from their family members’ Medisave. More females (64 per cent) than males (38 per cent) do so. Meeting the needs of economically vulnerable groups should be the prime objective of a retirement scheme. A 2005 World Bank paper on pension systems recommended that the state provide minimal pension payments for low-income groups which are unable to finance their own retirement savings. While public assistance is supposed to assist the marginalised, according to the Ministry of Social and Family Development, only 3,164 people were on ComCare Long-Term Assistance last year. State rhetoric about wanting more community involvement from Singaporeans has to be made meaningful through adequate social assistance that meets the needs of all Singaporeans throughout their lives, not just when they are employed. 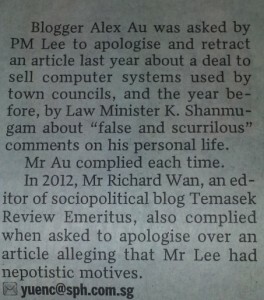 1 Pings/Trackbacks for "Yet another blogger threatened to be sued by the PAP leaders ….and the CPF minimum sum fiasco"